← Max Roach: The Most Structured Drummer Ever? SKF NOTE: I spotted this ad in the January 11, 1968 Down Beat. I know Hal Blaine did a great deal of studio work for the Beach Boys. Has anyone chronicled Dennis Wilson’s studio and/or concert drumming with the Beach Boys? 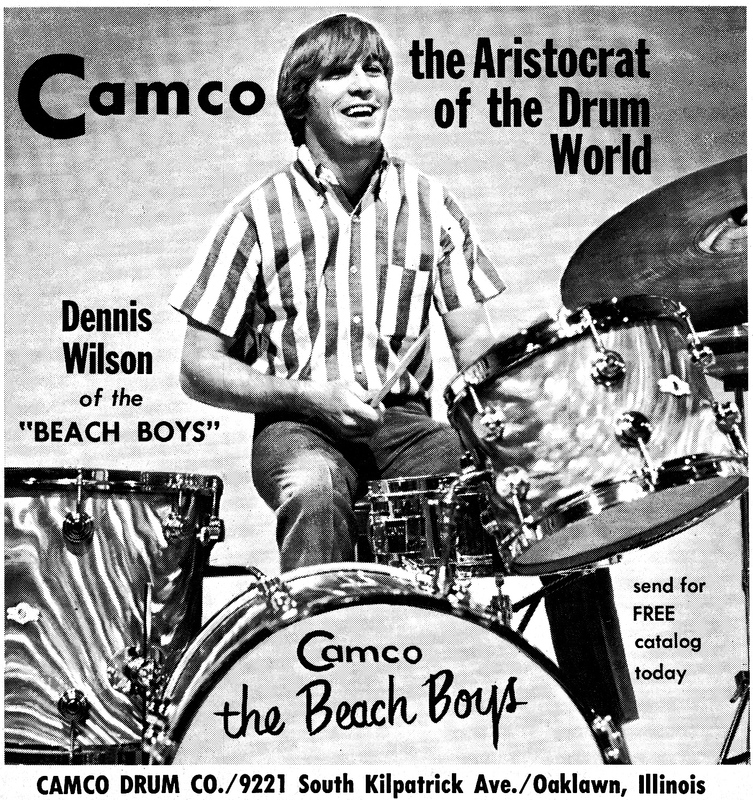 This entry was posted in Drum/Music News and tagged Beach Boys, Camco, Dennis Wilson, Down Beat, Drummer, Scott K Fish. Bookmark the permalink. I was a massive Beach Boys fan when I was younger, so I know a little bit about Dennis Wilson and his contributions to the group. There’s a biography about him called Dennis Wilson: The Real Beach Boy by Jon Stebbins, and while I haven’t read it, I did read a few things by Stebbins on a forum a few years ago, and he indicated that Dennis actually played drums on more Beach Boys hits than was originally thought (although, of course, Hal Blaine and other studio pros did play on a sizable portion). Among some of the tunes that Stebbins says Dennis played on were “Don’t Worry Baby,” “Wendy,” “When I Grow Up To Be A Man,” “Dance Dance Dance,” and “You’re So Good To Me.” I think he also played drums on “That’s Not Me” from Pet Sounds. In his later years (late 70’s through early 80’s) Dennis’s drumming became pretty erratic as his health declined, but prior to that I think he was a quite competent and often energetic drummer live. His playing on the Live in London album from 1969 (also released under the title Beach Boys ’69) is a good example of his live work.